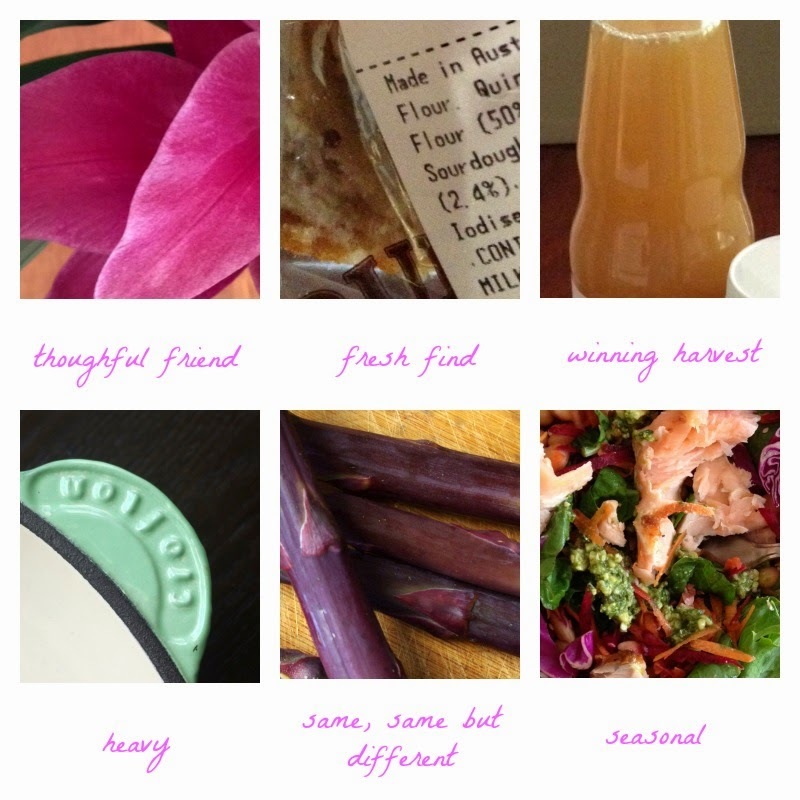 This month I thought I'd turn my 'In My Kitchen' post into a little guessing game. 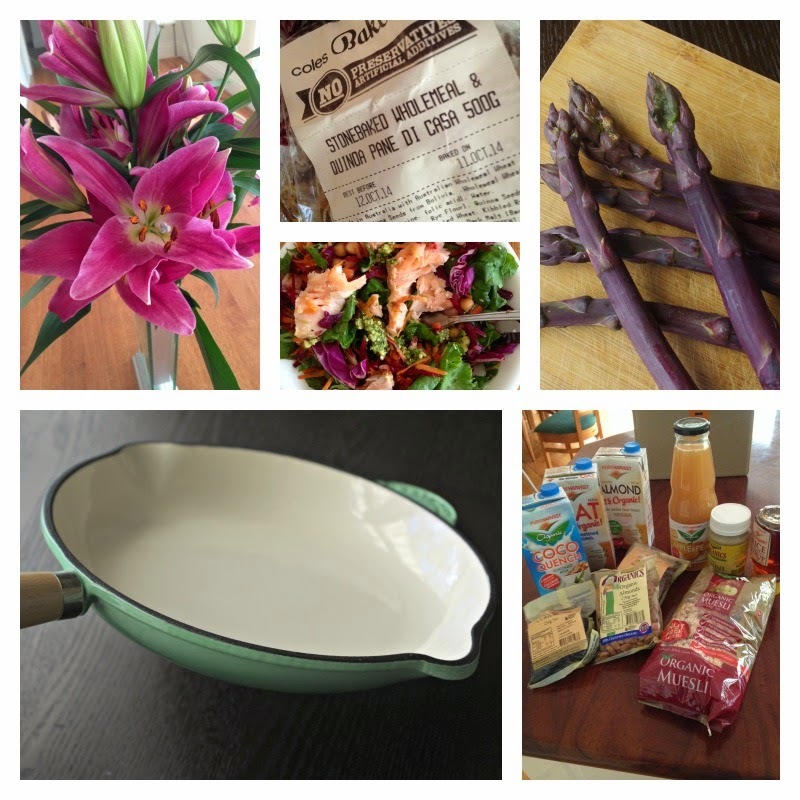 See if you can guess what's in my kitchen based on the photos and clues below. So how many did you get? Not too difficult, hey? The first was a beautiful bunch of purple lilies given to me by a lovely and thoughtful friend we had over for dinner. They looked and smelt beautiful for weeks, I couldn't believe how long the lasted! The second is a new loaf Coles has started to bake; a stone baked wholemeal and quinoa pane di casa. It's currently my favourite bread. The third is a fantastic Pure Harvest prize pack I won from Create Bake Make. Full of lots of goodies to play with in the kitchen, now I just need to get my recipe imagination going. How fun is it receiving a pack like this in the mail? The fourth is a cast iron pan. I love the colour, the way it cooks and that it's a great size for when I am cooking up a lunch for one. It was also a bargain in the Aldi clearance at $6.95. The fifth is purple asparagus. This is the first time I've bought it and you'll see it popping up in a recipe next week. Again, how good is spring colour? And last is a fresh colourful salad using salmon. I have a bit of a thing for salmon at the moment, and with the lovely weather kicking in, seasonal salads are firmly back on the menu. So what's happening in your kitchen this month? G'day What a great post to brighten my day! Thx for this month's kitchen view also! i love the cast iron pan. what a gorgeous colour. and that purple asparagus looks really tasty. and gorgeous lilies. That's a great idea, and I love your IMK this month... I have looked at purple asparagus... Now I might just buy it! Thanks for sharing! haha love your guessing game! I got the Coles sourdough cob loaf correct - because we just bought a loaf ourselves last week.